Good morning and happy Wednesday. Rubber Dance have a fun new colour/theme challenge for February, and here's what I've made. And here is the inspiration board. I started by making my background with Distress Inks and Oxides using the above colours. Then I chopped it up to make my rolodex cards. I know it's something you have to do, but I still hate chopping up a nice background lol. The background has been stamped with images from Crazy Flowers 2, and the main image and sentiment is Merry Magpie. This one is Take The Plunge. 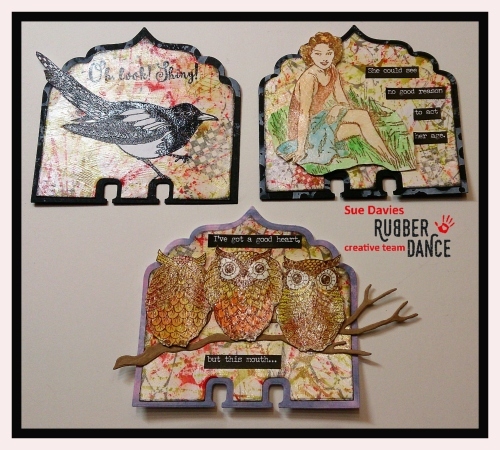 I hope that you like them, and that you join in with our challenge over at the Rubber Dance Stamping Lounge. These are great - I love the masterboard background, and it looks somehow so different with each different stamp. Very cool. I don't think you'll regret the Organic purchase - it really is a gorgeous die, and once you start cutting it up, there are lots of possibilities! Hello Sue , love them- and especially my favorite , the bird one , :-) showing your gorgeous background so beautifully , behind Melinas bird stamp . 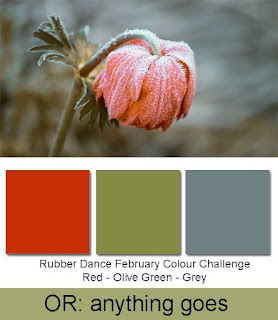 These are a super collection and great with the colours scheme running through using the masterboard (and know just what you mean curring it up), many thanks for joining in with our February theme at Stamping Sensations challenge. Beautiful work! Loving your background in those gorgeous colours. Thanks for joining us at Stamping Sensations this month. Stunning makes for our 'All thing Bright and BEAUtiful' theme at Stamping Sensations this month,Sue! I love them all, but especially the magpie. He is here waiting for me to ink him up. Thanks for joining us this month and Good Luck! Love these! Just exploring roladex art recently. You inspire me! Thanks for sharing with us at Fashionable Stamping Challenge!